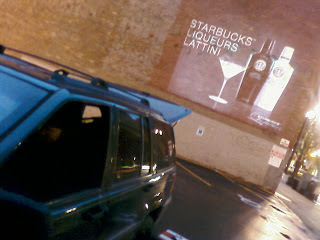 Leaving the office last week, I spied a Jeep Wrangler equipped with a generator and projection system casting a SBUX promo against a brick wall in Pioneer Square in Seattle. The two guys in the Jeep told me they work for a company who does this kind of work up and down the West Coast with "affiliates" in NY and Boston. Apart from the legality, definitely got my marketing mojo going.